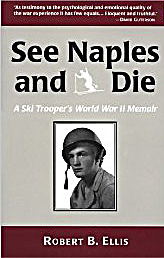 Robert Ellis is the author of See Naples and Die: A Ski Trooper's World War II Memoir (1996). At age 18, Ellis joined the 10th Mountain Division ski troops to break through the German defences in the Alps. The author's account of his war time service is based on the diary he kept as a soldier, his letters back home, as well as the records of some of his comrades and information gleaned from military histories. What emerges from his collection of sources is an honest, graphic, and often funny personal narrative within the broader historical context of the conflict. Numerous illustrations and maps assist the reader. A signed copy of the book is available in the local authors collection of the Bainbridge Public Library.